The Northwest Ordinance—adopted in 1787 by the Congress of the Confederation and passed again by Congress in 1789 after the ratification of the U.S. Constitution to govern the Northwest Territories, which included modern day Ohio, Indiana, Illinois, Michigan, and Wisconsin—is undeniably an ordinance that inherits and extends the common law tradition. This means property rights take center stage and due process of law is established as a means of protecting property rights and the rights constituent to property such as life and liberty. Remembering the importance of due process is important in the wake of terrorist attacks, like the one in Boston, as people are sometimes too tempted to trade liberty for security. 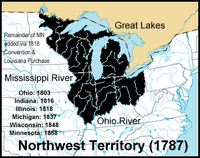 Furthermore, going to the Northwest Ordinance allows us to gain a deeper understanding of our Constitutional heritage. Private property is man’s liberty manifested on the natural world. Thus, property is an instrumental and an intrinsic right. It is instrumental—which is the common law’s focus—because the right to own private property creates a buffer between an individual and other individuals and an individual and the government. Property rights, properly protected, guarantee that what one labors for remains in the possession of the one who labored and thus earned. Protection of private property is essential to the protection of liberty as understood in the common law tradition beginning with Magna Carta. Property rights are at the core of due process rights as well. Due process rights exist to make sure the government does not usurp its power in seizing or invading someone’s property or person. The relationship between property and person is inseparable in the common law tradition and in the natural rights tradition articulated by John Locke—the U.S. Constitution is an amalgam of these two traditions. Since property is an extension of man, his security only exists so far as man is able to extend his will and his right over them. And if property is threatened so to is man’s person given that property is an extension of him. Taken less philosophically we might say: If the government is willing to take your money or house without due process, it is also willing to take and search your person without asking. Merely asserting a right and codifying it in a constitution or ordinance is not enough to protect that right. The protection of rights requires that the government is restrained from acting tyrannically which requires a republican form of government as well as one that separates the powers of legislating, executing, and judging into separate branches. The Northwest Ordinance provides for a republican form of government with a separation of powers thus continuing the intellectual heritage of governing documents that would lead to the U.S. Constitution. This guiding principle is then implemented by the system of government established in the articles that follow this proclamation. But in case the governing bodies have any question, or if the people have any question about what laws constitute good laws, the Northwest Ordinance provides some guidance by stipulating common law provisions that were also adopted in the U.S. Constitution and the Bill of Rights. Read the following passage from the Northwest Ordinance and look for the similarities between it and the U.S. Bill of Rights, particularly the 4th and 5th Amendments. Reflecting on our founding fathers and our constitutional tradition requires to go further than the Declaration of Independence and the Constitution. As I have tried to argue there is a tradition that can only be understood, uncovered, and fully appreciated when we look at other documents and their relationship to the Constitution.